Dwarf planet Ceres isn't done surprising us yet. When scientists first noticed mysterious bright spots on the dwarf planet's surface, they didn't know what to make of them. Guesses ranged from ice patches to water-, ammonia- and methane-spewing cryovolcanoes. Finally, research released in December 2015 suggested the sparkling spots were deposits of magnesium sulfates — the same compounds that make up epsom salt. The mystery was solved. Or so we thought. One of the bright spots on Ceres. Now a pair of studies published this month in the journal Nature and the journal Nature Geoscience have just upended what scientists thought they knew about Ceres and its strange bright spots. The new research suggests the salt is likely sodium carbonate that formed through some process involving liquid water. 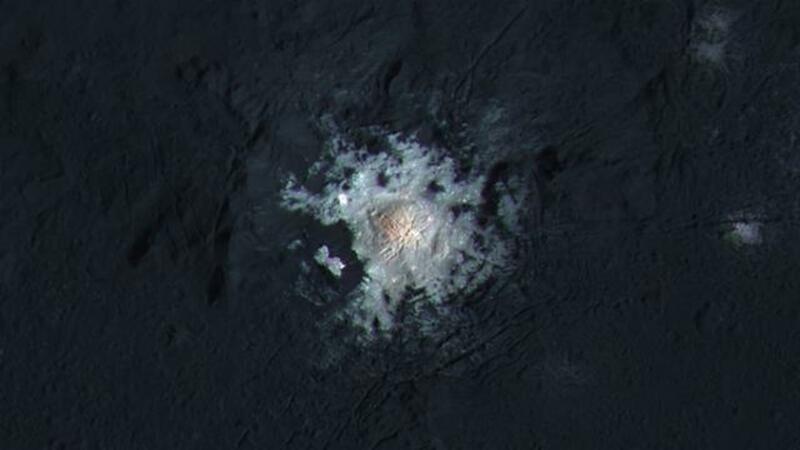 The image below shows a bright spot in the Occator Crater on Ceres. The red coloring in the inset marks a high concentration of carbonate. Carbonate on Earth forms out of ocean water. It's present in things like limestone, coral and the shells of sea creatures. But the new research suggests there's scant water on Ceres, so scientists have no idea where all this carbonate came from. "This is the first time we see this kind of material elsewhere in the solar system in such a large amount," Maria Cristina De Sanctis, lead author on one of the new studies, said in a statement. One of the new studies suggests the surface of Ceres is mostly rock, not ice as previously believed. The dwarf planet's rough terrain full of deep craters and mountains mean the subsurface is no more than 40% ice. While that might be enough to form carbonate, the ice would have to melt first and that seems unlikely since temperatures on Ceres hover around minus 100 degrees Fahrenheit during the day. It's possible that something is happening on the inside of Ceres that's heating up subsurface ice, or the sodium carbonate could be the remnants from an ocean that has since disappeared, according to NASA. "Understanding water on Ceres — how much it has, how it attained and retained it, whether it formed in the asteroid belt or further out — has really important implications for the formation of the solar system overall," Michael Bland, lead author on one of the studies, told Gizmodo. The researchers will observe other bright spots on the dwarf planet and see if they find similar chemistry.